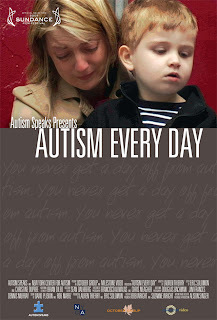 The film Autism Every Day will soon show – January 22 and 27 – at the Sundance Film Festival. Like many efforts to treat or educate autistic children or to speak about the realities of some autistic persons this film has generated criticism amongst some autistic persons, caregivers and professionals who do not believe that Autism is a disorder. From that perspective autism is simply a variation of human existence neither inherently better or worse than any other variation. Thankyou for this post. I’d just like to say that I share your sentiments 100% on this, and I’m interested in seeing the 44 minute version. Contrary to a lot of negative opinion surrounding this video, I believe it shows the everyday reality of family life with, and for severely autistic children. Most importantly, it is aimed at showing this reality. I haven’t watched the video but I did see a clip on someone else’s website – it was a repeat [loop] of a mum expressing her negative feelings. The controversy surrounding the film, warnings to boycott it and so on, leave me as usual, sitting on the fence. You are welcome jonsmum. It is a shame that parents are pilloried for descibing the realities of life raising severely autistic children. I can’t remain on the fence. I also think that the severely autistic children being raised by the famlies in the video will suffer if their parents voices are silenced by hysterical reaction of people with no responsibility for raising them or caring for them as children, or as adults when their parents have passed on. The “Autism is Beautiful” movement seems at times to be ashamed of the more severely autistic members of the spectrum. I am of two minds about the video. On the one hand, I agree with you completely that this side of autism needs to be shown. I am also a parent of a child with severe autism. When I first saw the video, I was founding myself crying and nodding many times. I was glad to see an accurate portrayal of some of the tribulations that can come with raising a child with severe disabilities. On the other hand, I was bothered by how overwhelmingly negative it was. Life with autism can be ugly and hard. But it isn’t always. There are wonderful momments in between. There is still love and joy. In short, I think it is an important and powerful film. But I think it would have been even more powerful if it had shown a little more balance. I am very interested in seeing if the longer version portrays this balance.